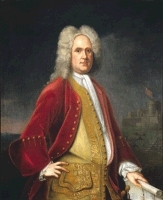 Governor Alexander Spotswood was born in Tangier, Morocco, in 1676, where his father was a physician to the English garrison in the African colony. Alexander Spotswood arrived in Virginia in 1710 as the new Lieutenant Governor. He fit well into colonial society, and soon became friends with wealthy plantation owner William Byrd of Westover. A sociable bachelor, Spotswood set out to have adventures in the rough back country that was Virginia in the early eighteenth century (Cappon 3-4). During a tour in the spring of 1713 of hundreds of miles of frontier to investigate defenses against Indians, Spotswood discovered an iron ore deposit near the Rapidan River. This discovery aroused Spotswood’s interest in the mining and production of iron in the colony. Soon after the trip, he secretly purchased several thousand acres near the iron ore deposit. As royal governor, Spotswood was not encouraged to take on private enterprises (Felder 7). Under the guise of a frontier defense program, Spotswood sponsored the immigration of a group of German miners and their families in May 1714. He intended these men and women to be indentured servants to his mining operation. To accommodate the German settlers, the Assembly created a small non-Anglican parish that would save the new settlers from paying tithes to the Anglican Church. At the same time, Spotswood ordered that the River Road be extended from the falls to the new settlement. He did all this to set up for his planned mining expedition. Indeed, he now owned the land on which the ore was found, settled miners close to the mine, and had a new road that would transport the ore from the mine to the banks of the river (8-10). It is not clear when Spotswood’s furnace, or Tubal Furnace as it was called, began operation. Most likely by 1720 the mine was up and running. His mine was the first fully functional, successful mine in the colonies. A couple years later, he no longer tried to hide his enterprise from the British (Cappon 10-11). Rumors spread that claimed Spotswood’s days as governor were soon over and in fact, Hugh Drysdale replaced Spotswood as governor in 1722 (Felder 14). As a private citizen, Spotswood remained in Virginia, uncharacteristic for most ex-governors. He focused his attention on building a church, courthouse, and home in Germanna, close to his mines. He began to uses slaves as workers for the mines, rather than indentured servants, who had the tendency to move away as soon as possible (Cappon 12).In 1724, Spotswood returned to England for a while. He left his mines in the care of his cousin, John Graeme, whose thoughts, Spotswood claimed, “were always among the Stars” (12). The furnace stood quiet for long periods during Spotswood’s absence. Slaves were lost and the cattle were nearly starved under Graeme’s supervision. Spotswood finally returned in 1730, with a wife and young children. Along with his mines, he was now taking over as Deputy Post-master General for the colonies (13). Spotswood’s and other iron entrepreneurs’ success caught the attention of William Byrd, who decided he, too, wanted to try his hand at mining and producing iron. Byrd kept copious notes of his visit in his diary. He claimed Spotswood had one hundred slaves working on the mines. He also reported on the requirements for building an iron furnace. These included, he said, teams of oxen to transport the ore from the river to the banks of the Rappahannock for shipment, a water source, and plenty of ore and wood (Wayland 55). Alexander Spotswood died in 1740, as one of the most successful early settlers to Virginia. His reign as Royal Governor was one of relative peace and prosperity. He operated the first successful iron furnace in North America. His mine maintained prosperous operation well into the 1760s (61). “Alexander Spotswood,” Clint Schemmer, “Intriguing Historians have renewed interest in the outpost carved out of the wilderness by Alexander Spotswood’s German settlers,” (Fredericksburg, VA) Free Lance Star, November 17, 2007, http://fredericksburg.com/News/FLS/2007/112007/11172007/333236 (accessed April 12, 2008). Bruce, Kathleen. Virginia Iron Manufacture in the Slave Era. New York: The Century Co., 1931. Byrd, William. The Prose Works of William Byrd of Westover: Narratives of a Colonial Virginian. Edited by Louis B. Wright. Cambridge, MA: The Belknap Press of Harvard University Press, 1966. Cappon, Lester J. “Introduction,” in Iron Works at Tuball by Alexander Spotswood, 3-16. Charlottesville, VA: The Tracy W. McGregor Library of the University of Virginia, 1945. Dodson, Leonidas. Alexander Spotswood: Governor of Colonial Virginia, 1710-1722. Philadelphia: University of Pennsylvania Press, 1932. Felder, Paula S. Forgotten Companions: The First Settlers of Spotsylvania County and Fredericksburgh Town. Fredericksburg, VA: The American History Company, 2000. Wayland, John W. Germanna: Outpost of Adventure, 1714-1956. Culpeper, VA: The Memorial Foundation of the Germanna Colonies in Virginia, Inc., 1989. This entry was posted in 1700s, Amy, Early Settlement, Iron Works, Spotsylvania and tagged Alexander Spotswood, Germanna, Iron, William Byrd on March 20, 2008 by amyb.